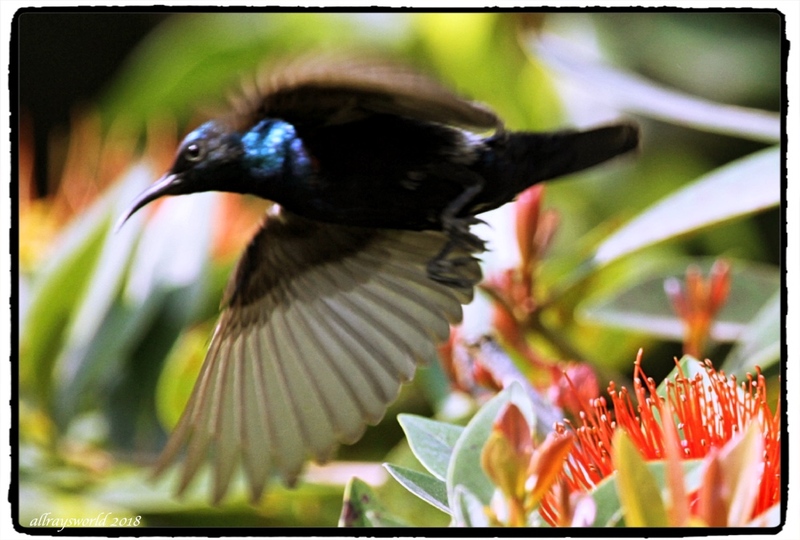 The second couple are of the species known as Purple Sunbird. The female looks quite like the female of all other Sunbird species. The male is dressed in exquisite, iridescent, purple plumage, and he is also quite vocal. I see the couple together in the First Love shrub, so believe they also have chicks in their nest. J'aime bien leur bec recourbé. Ray: Leurs jolis becs sont façonnés de cette façon pour les aider à prendre le nectar des fleurs en forme de trompette, Martine. Ray: Stunning to watch them flitting about, and with the sun glinting off their reflective plumage, Larry. Ray: Sometimes Sunbirds are referred to as Asian Hummingbirds, Sherri...as you will see in the series, I point out the similarities. The shrub is attractive to Man and Bird. Ray: Handsome and melodious, Elizabeth...this guy makes a lot of noise. I would like to look as smart as he does. Maybe I'll talk to my tailor..
What a crooked beak! The male bird is a beauty like often in the nature. Ray: The curved beak is especially useful for taking nectar from deep inside a trumpet flower, Philine. Très beau cet oiseau encore ! Ray: Je suis ravi d'accueillir deux espèces de Sunbird en même temps, Claudine. Ray: Both these pics show the male bird, Lisl. They seem to have excellent eyesight. Ha, I thought at first that you had posted the same picture twice. I must concentrate harder. Ray: Perhaps...if I separated each bird posting with a steam loco posting...this would help, Chad? Ray: Much smaller even than House Sparrows, Bill. Are both couples nesting in the same shrub? Ray: The take nectar from the same shrub, even at the same time, but their nests are not close together, Mary. Apart from seeing these lovely birds in your First Love shrub it must be interesting investigating what species they are. Ray: This is true, Brian. 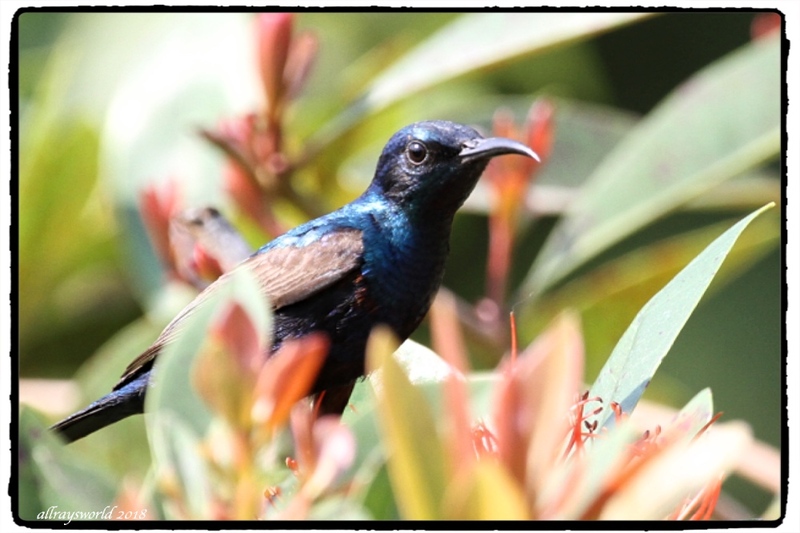 The shots of the Brown-throated Sunbird male let me see well enough to make an identification only when I was creating this SC series. Ray: Busy and brilliant little gems, Tom. Ray: Very common among birds, Alan.